Dr Derrick Bennett, study author, University of Oxford, UK, said: "Our study suggests that people who use solid fuels for cooking should switch to electricity or gas as soon as possible." It has been suggested that air pollution from cooking with solid fuels, such as coal, wood, or charcoal, may lead to premature death from cardiovascular disease, but there is limited evidence. This study assessed the association between solid fuel use for cooking and cardiovascular death, as well as the potential impact of switching from solid to clean fuel (electricity or gas). The study included 341,730 adults aged 30-79 years recruited from ten areas of China in 2004 to 2008. Participants were interviewed about how often they cooked and the main fuel used at their three most recent homes. The researchers then estimated the duration of exposure to solid fuels. The analysis was restricted to those who cooked at least weekly at their three most recent residences and did not have cardiovascular disease. Information on mortality up to 1 January 2017 was collected from death registries and hospital records. The average age of participants was 51.7 years and three-quarters were female. Nine out of ten had spent at least 20 years in their three most recent residences. Overall, 22.5% of participants had primarily used solid fuels for cooking for 30 years or more, 24.6% for 10-29 years, and 53.0% for less than ten years. Among the latter, 45.9% had never used solid fuels in their most recent three homes and 49.1% had switched from solid to clean fuels during this period. During 3.4 million person-years of follow-up, 8,304 participants died from cardiovascular disease. After adjusting for education, smoking and other cardiovascular risk factors, each decade of exposure to solid fuel was associated with a 3% higher risk of cardiovascular death (95% confidence interval [CI] 1-4%, p=0.0002). Participants who had used solid fuels for 30 years or longer had a 12% greater risk of cardiovascular death than those who had used them for less than ten years (95% CI 3-21%, p=0.0045) (see figure 1). Compared to persistent long-term use of solid fuels, adopting clean fuels was associated with a lower risk of death from cardiovascular disease. 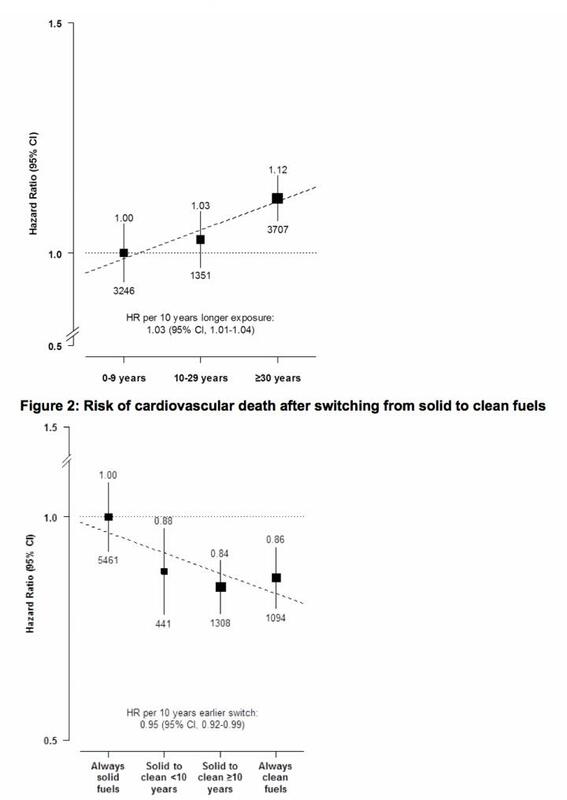 Each decade earlier switch from solid to clean fuels was associated with a 5% lower risk of cardiovascular death (95% CI 1-8%, p=0.0067). Participants who had changed for ten years or longer had risks comparable to persistent clean fuel users (see figure 2). Professor Zhengming Chen, principal investigator, University of Oxford, UK, said: "We found that long-term use of solid fuels for cooking was associated with an excess risk of cardiovascular death, after accounting for established risk factors. Switching to electricity or gas weakened the impact of previous solid fuel use, suggesting that the negative association may be reversible."